Kitchens are the heart of a household as it is the place where families; cook, eat, socialize, work and relax. Transforming a kitchen to an open plan space by having a rear extension on the ground floor can turn a kitchen space into a modern inviting area for entertaining. There are different routes depending on your property, from combining adjoining rooms or adding a conservatory to a building a completely new room or rear extension. Small extensions might not need planning permissions as long as they are under the guidelines of the permitted development. Larger extensions, or addition to a flat, always need permission. As well as listed buildings always require consent, whether or not the work is permitted development. Converting two rooms into an open plan allows the family and guest to perform numerous functions together in the same space. This is great if you want to combine a kitchen-living room or kitchen-dining room to be able to entertain or even keep an eye on the children while cooking in the kitchen. Most kitchens are in the rear so with an open plan there is potential for more natural light into the space by adding a bi-folding door to the garden. There would be an uninterrupted line of sight where you can still see everything while other people are performing other actives such as watching TV or kids playing. Open plan gives you a larger feel to space as well as the kitchen becomes a focal point of the house as you walk in the property. A structural engineer will need to ensure that the wall that is being removed isn’t a load bearing wall. In the case the wall is a load bearing wall your structural engineer will need to do addition calculation for the type of RSJ (rolled steel joist) that will be acting as a supporting beam, this will be additional cost and might involve more disruption to the construction of your open plan kitchen. A conservatory is an additional room to the house that is in the rear of the property on the ground floor looking out at the garden. The floor area for a conservatory doesn’t exceed 30m­­­­­­2 floor area and is thermally separated from the building it is attached to, also has an independent heating system from the main building. By adding a conservatory this could add value to your property to potential buyers especially if you have a south facing garden, a potential buyer wouldn’t mind paying more for the house if there is already a conservatory instead of undertaking the project themselves. A conservatory can be used as a new room to the house or an extension of an existing room, where it brings a lot of natural light as the conservatory would be completely glazed. Single story extensions are a simple extension built onto a part of the house where by one side (or more) of the extension is attached to the property on the ground floor at the back of the property in the garden area. This is a great way of adding more space to your existing kitchen, by having more room there could be a dining space, extra workspace or for a bigger area for appliances. The design of the roof should work with the overall look of your property, and if it will affect your neighbors sunlight. Two stories or multi-story extension is similar to a single story extension that is built to a part of the existing building. The possibly for neighbors to appeal against your extension is greater as it might be overlooking or blocking some of their natural light. We would strongly advise that you get a letter from the planning department before you start your construction and talk to your neighbor in case they do have some issues about it so they don’t feel left out. However, two story extensions to your home give you that extra space on the ground floor and on the first floor as it could be an additional bedroom or perhaps an en suite for the master bedroom. This extension will also increase your value to your property if you decide to sell in the future. Side return extensions are a common choice for a Victorian or Edwardian era house. These houses usually have a gap at the side of the house, which is not often used and are called dead space. By adding a side return you are not taking anything from your garden space but are adding to the kitchen space that you already have, by adding skylights this will bring more light into the area and be utilizing the dead space. This is the smallest type of rear extension which means smaller job and cheaper than the other extensions. Wrap-around extension is the biggest out of the kitchen extension ideas, as it requires more work but they do add a larger space the property on the ground floor. A wrap-around extension is a side return and rear extension together in an L shaped space, there are two option for a roof it could be sloped or flat. This does give you the opportunity to completely open up the kitchen and have as much natural light coming from the top as well as having the full-length view of your garden with bi-folding doors. You could even potentially add a utility room or a downstairs WC or a walk –in storage and use all the space available. It is always best to contact your local planning officer first as they can suggest to you what will be appropriate. Planning regulations can vary from region to region but there is a set of planning developing guidelines (you can see on a previous blog; Essential guide for rear extension). Special consideration is needed for a property that is located in a Conservation area or a National Park as you’ll need to work closely with your council planning permissions to know exactly what modification you can do. Planning the layout of your kitchen, you will need to keep in the back of your mind the basic necessities of each kitchen requirements (fridge freezer, sink, cooker) and then add all the other features that will go around them. How much storage is available to work with, and if you want certain worktops being used for different functions. 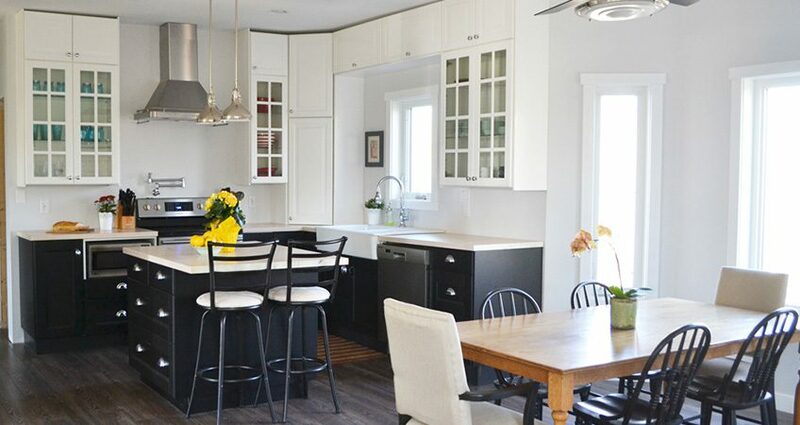 Depending on how much area you have to work with, there are different styles of kitchen layouts that could be done. The galley kitchen is cabinets all in one line on one wall. This is done in small narrow kitchens. Double Galley kitchen is where the cabinets are on two walls opposite each other. Narrow kitchen uses this style to get enough storage and basics into the kitchen. L-Shape kitchen layout is a popular layout in small and large kitchens as it offers good storage and provides a good effective working triangle. U-Shape kitchen layout usually fitted for a medium kitchen and it can have the three main necessities (fridge freezer, sink, and cooker) all on their own side in the kitchen, giving this an excellent triangle working area. Kitchen island is a great way to of breaking between the space and can be used a breakfast bar as well as additional storage, more worktops and another area for a great sink or a cooker to be separate from the wall. All the above extension are a different prices but as a general cost should estimate from £1,260 and £2,000 for an extension that is plastered finish giving a cost of £25-50,000 for the footprint of around 25m­­­­­­2. The total cost of the project might vary depending on the specifications of the kitchen itself, plumbing, electrics, materials, and appliances. This is why it is always good to sit down and consult with your designer about every detail you want in your extension especially starting off with your budget as they will be with you all the way through the development of your new extension. Why planning application must needed in UK?